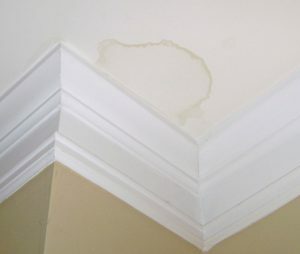 Time and time again, we have homeowners calling us complaining of a roof leak. They can see the watermarks all over their ceiling but cannot find an obvious source of the leak. They can’t remember if the watermark got larger when it last rained or if it first emerged after a big snow storm. When a homeowner calls us with the problem, the first thing we perform is a water test. We spray the section of the roof which corresponds to the watermark location in hopes of recreating any leaks. This simple test is the easiest and honestly, most efficient ways to identify leaks. Sometimes, the water test comes back with nothing. No water came through anywhere. This rules out the most obvious causes of a leak; faulty shingle or sealant somewhere. The next step; crawl into the attic. Attics tend not to be the most pleasant spaces which is why most homeowners probably spend little to no time in their attic but when you have a leak, it should be one of the first places you investigate. When we access the attic, we inspect the roof trusses, sheathing or rafters for moisture or mold. You might smell mold or a strong musty-odor or your insulation may seem flattened and packed-down. These are the most clear signs of a condensation problem. What is attic condensation? In short, it is when the temperature between your attic and your house is extremely different. In the humid, summer months, hot air builds up in the attic and flows downward into the living spaces below. In the winter, the process reverses. As heated, interior air moves throughout a home, it collects water vapor that is created when homeowners bathe, cook, wash dishes, do laundry, and run humidifiers. The warm, moist air then travels into the attic where the air is cooler and drier. As the warm air contacts the cooler surfaces of attic structures like rafters, trusses and roof sheathing, the moisture it was carrying collects on the surface as water droplets or frost. Eventually, this condensation drips onto the insulation below and leaks through the attic floor, which is when you begin to see water marks. It can also cause mold to grow on roof sheathing, trusses, rafters and ceiling floor. Homeowners often ask why condensation seems to suddenly appear. They’ve been in the house for so many years without a problem. Well, it is extremely difficult to answer that question. Sometimes, condensation could have been happening for years but the process is slow and it is just now becoming noticeable. Sometimes, weather can be a worsening factor; like when we have long stretches of extreme weather like snow or humid temperatures. Sometimes, it may be from your own activity in your home; an increase of cooking, showering or laundry. There are so many factors it is nearly impossible to identify the exact reason. What is certain, however, is that condensation issues must be addressed immediately which means properly ventilating your attic. It is best to consult a profession like Modern when trying to determine if you have a condensation issue and steps to take in solving it. The quicker you act to address a leak, the less damage, time and money you will see and spend. Feel free to contact us with any specific questions!